"The results of a life spent satisfying a remarkable intellectual and artistic curiosity can be seen in artist Erwin Meyer's recent body of work, now expanding and available to the public after a hiatus of more than 30 years. 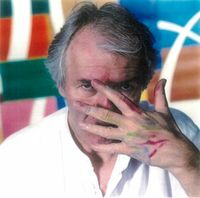 Born in Germany in 1941, Meyer has lived and traveled extensively, immersing himself in the art, language, and culture of over 30 countries. As a young man, Meyer trained as a graphic designer and worked in Geneva and Berlin. After traveling to South America and living briefly in Stockholm he moved to London in 1964 to soak up the flourishing creative scene while studying languages and working as a translator. His exceptional linguistic skills would prove key to his lifelong ability to support his family while pursuing art in London, Düsseldorf, San Francisco, New York City and Austin. His initial interest in painting came in the mid-1970s. In order to gain admittance to a prestigious school of architecture in London, Meyer needed a portfolio of art or architecture, so he picked up a paintbrush and studied art. This pivotal move would ultimately lead Meyer away from architecture toward a realization that painting would serve as his medium of creative expression for the rest of his life. Over time, Meyer's work has evolved from drawings and paintings populated by strong architectural elements to an intense exploration of geometric shapes rendered in bold colors. Meyer's work has been exhibited in numerous cities, purchased by individuals and collectors, and commissioned by corporations. His most recent work of 55 canvases includes two large eight-canvas polyptychs, which focus and enliven any space, and invite viewers inside a mesmerizing riot of colors and shapes." © 2016 Erwin Meyer Studio, LLC. All rights reserved.